Well, the drywall is roughed in, and the plumbing and electrical is roughed in. It doesn't look like much at this point, but this is where the magic starts to happen! I have finally picked the floor tile, and the paint colour. Behr Pebblestone... appropriate really! The sink is a lovely burnished copper and should age well. I am in love with the floor tiles, they are going to look fantastic with the barn board trim. 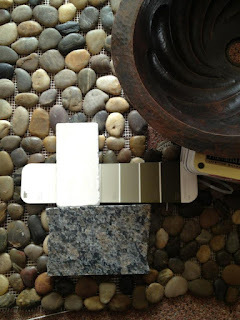 The granite counter is a grey tone, with flecks of warm brown which should work well with the oak cabinet and the sink. Stay tuned to see how things fall together!